The weighing and selection of oysters are jobs that are often performed manually, given the particular shape of the animal that, with the roughness of its shell, makes it difficult to work with automatic machines. In addition, oysters are considered by many as "valuable" molluscs, and are often sold to the piece rather than by weight. 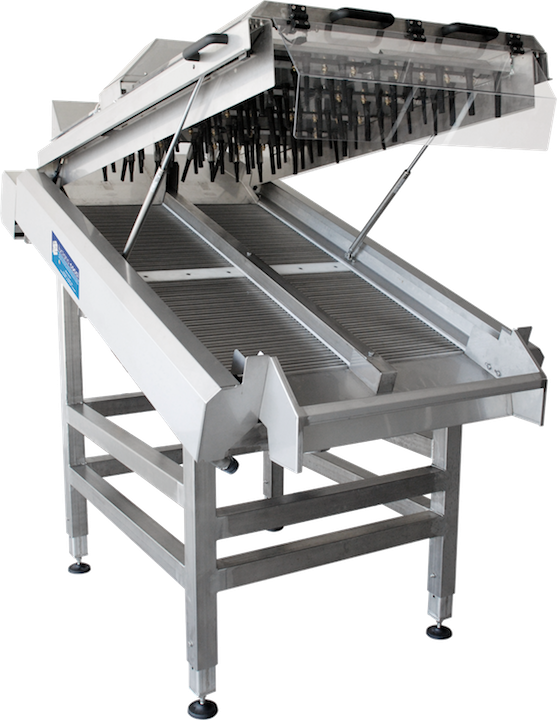 Our automatic oyster sorters and graders treat the product with extreme delicacy, managing to separate the molluscs in order to inspect or weigh them one at a time through advanced, and at the same time simple, mechanical systems. The lines have been designed to be modular: the number of calibration belts can vary depending on the hourly productivity required, and the number of product collecting stations can also vary. Our equipment is completely built in Aisi 316L stainless steel and plastic materials suitable for the contact with food. The oyster market, especially the European market, recognizes different "classes" of oysters based on their individual weight. Our calibration lines can weigh each individual mollusc thanks to special high-speed sensors, and distribute them on the different stations, dividing them according to their weight classes. Once separated, the oysters can be inspected by an advanced vision system that can classify the product by size, shape, color or surface defects. The molluscs will then be divided on the different collecting stations according to the set of parameters chosen by the operator. Each calibration tape can classify and manage up to 9,000 oysters per hour: the scalability and modularity of these lines can therefore reach up to 25,000 pieces per hour by simply increasing the number of sensors (actual productivity can change in function of the average caliber of the processed product). The entire grading and sorting line is managed by the operators through a multilingual touch-screen panel through which it is possible to view and modify all the parameters related to the inspection of the processed product. The system also allows the user to view, save and recall important statistics on machine functionality, such as selection rates or average batch productivity.